The Rotary Club Rotorua West is one of four Rotary Clubs in Rotorua. With about 40 members it is quite a big club and, as we could see, with a very good attendance! 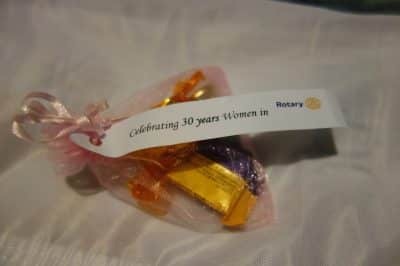 As a female Rotarian I was very pleased and excited to see how the club celebrated „30 years Women in Rotary“. Even if they had a full program they encouraged us to take 15 Minutes of their time to present ourselves and the project. Thank you very much for this time! 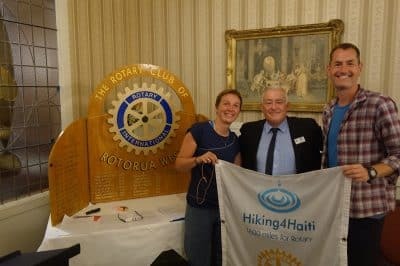 Enough to tell all about the terrific experiences we made so far in New Zealand and about Hiking4Haiti. We feel very honored, thankful and motivated by the spontaneous donation the club made for our cause. Thank you for this, dear Rotarian friends! We enjoyed this evening immensely!